Can I Trim My Shrubs in November? Yew shrubs grow easily in sun or shade and are one of the easier evergreen shrubs to prune. Without regular pruning, they can grow rapidly and look "wild." Unlike other evergreen shrubs, which only form new buds on young wood, yew shrubs can be pruned back to old wood. They will then regrow back from the old wood. 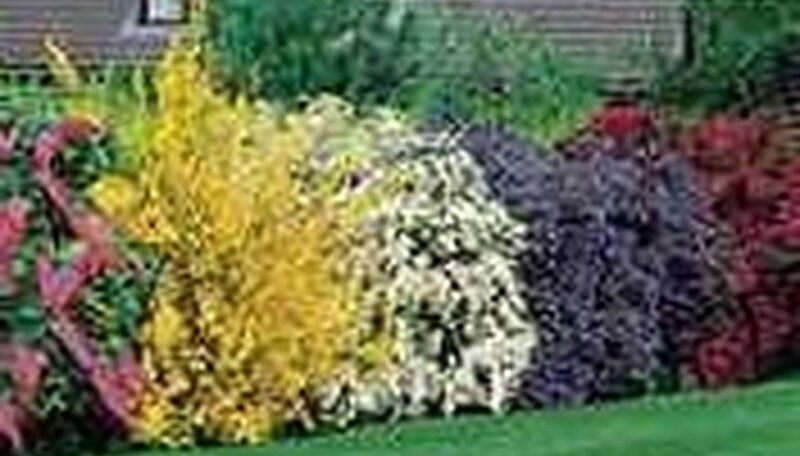 Pruning should be done in late winter, so the shrub fills out nicely with spring's new growth. Prune off branches that cross through the shrub or grow at sharp angles compared to the rest of the branches. 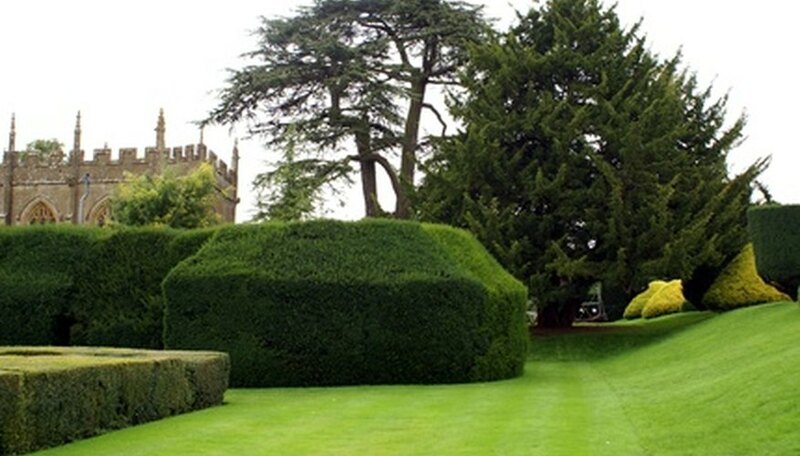 Thin the yew shrub out by selectively removing thicker branches. You want sunlight to reach the middle of the plant. Trim the ends of the branches to even the yew shrub out. Strive for a shrub that is wider at the base than the top. This allows sunlight to reach the bottom, which keeps the shrub full and lush. Round out the top of the shrub to help with winter snow loads. A flat top can be damaged after a heavy snowfall. Trim the shrub after the new growth finishes flushing. Use a hedge trimmer to even things out to keep your yew shrub looking great all summer. Choose shrubs that are native to your area, as they are more likely to grow well. Pay close attention to the color of the shrub’s leaves, looking for good color and leaf form. Inspect the shrub’s root system, if it is not covered, and look for roots that appear damaged. Choose an area rich in native soil. A properly-balanced location will not need any soil amendments. However, if the location is heavy with gravel, it may be necessary to add peat or compost to provide a proper growing environment. Dig a planting hole that is wide and shallow, allowing room for roots to grow. The planting hole should be three times as wide as the shrub’s root balls. Expose the root ball if it is covered with burlap, then firmly place the specimen into the hole. Provide plenty of loose soil for root balls to expand. Remember that roots grow outward. Fill the planting hole with native soil, being careful to remove air pockets. Apply mulch and begin a watering regimen. If the planting site is in a particularly dry area, receiving less than an inch of rain per week, use a soaking hose to water the area. Wait until the spring to apply fertilizer. Remove all the branches with leaves from the shrub with a pruning saw or pruning shears. Shrubs need photosynthesis to live. By removing all the branches with foliage, you are taking the first step to killing the shrub. Paint a non-selective herbicide that contains the active ingredient glyphosate on the cut ends of the branches. Dig up the stump of the shrub. Dig around the shrub 2 feet from the trunk. Remove soil as necessary and work your shovel down and under the shrub stump. After it's adequately loosened the stump will pull out. Lay down black landscape fabric over the shrub's former location for a few weeks. If there are any living roots left in the ground, the fabric will prevent them from accessing sunlight and they will quickly die out. Prune shrubs in the late winter to early spring before new growth begins. During this time, it's easier to prune without leaves and buds obstructing the plant-branch arrangement. Using pruning shears, thin out the tallest and oldest stems first. This will lead to hearty branch development. Pruning shears can cut up to 3/4 inches in diameter and are ideal for shrubs. Hardy shrubs such as hydrangeas should be cut back to the first pair of buds. Cut the branch at its point of origin from the main stem, resulting in a more open plant without promoting excessive new growth, which can make the plant top heavy. Prune deciduous shrubs by thinning branches of any broken or crossed roots. Cut back dead branches that have been infected by disease and insects. Identify azaleas by the vibrant flowers that cluster. The foliage stays green all year and blooms in the spring. The flowers are tubelike and come in many different colors. Azalea bushes also get very large, enabling the user to plant them as privacy hedges and to cover home foundations. 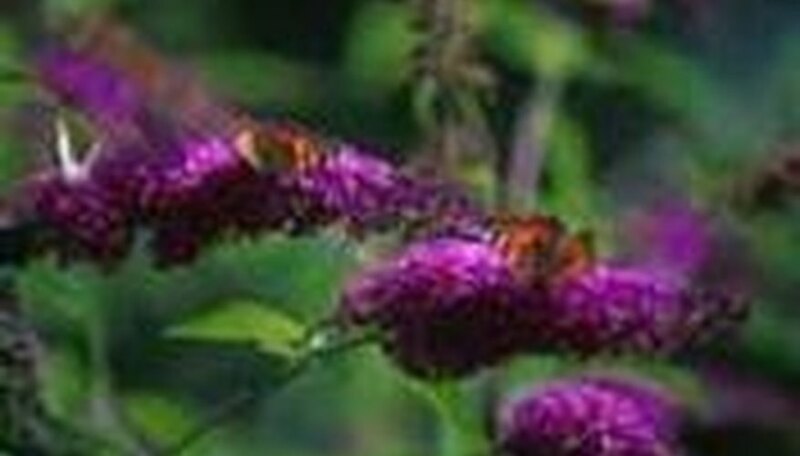 See the butterflies flock to the butterfly bush. This small bush has colorful flowers that bloom in a cone shape, and butterflies love the nectar from these flowers. The cone-shaped flowers also look like butterflies in the wind. Spot a lilac bush by the fragrant purple, red or white flowers that bloom on the sprig. The flowers are small, and in small clusters, which creates a large group of flowers along the end of the stem. The flowers bloom in late spring and continue until mid- to late June. 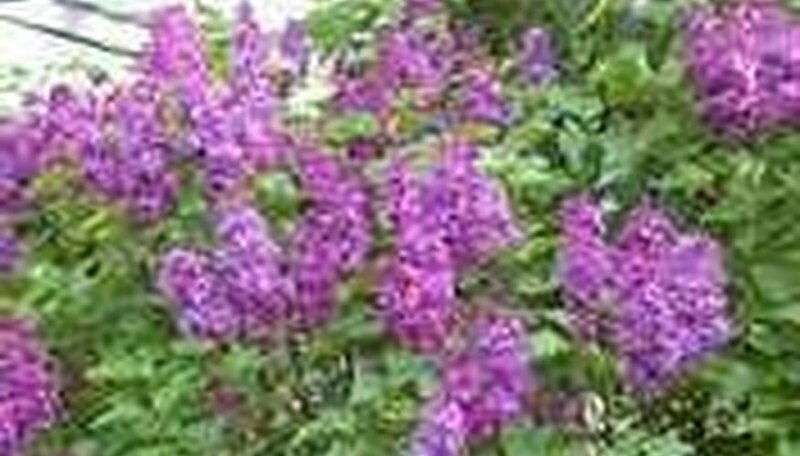 The lilac bush can either be trimmed to stay smaller or pruned to grow into trees. The scent of the lilac bush can be smelled from a long distance, and is so strong that it is used often in perfumes and incense. Identify oleander bushes by the large showy flowers in vibrant colors in the spring. The flowers also have a fairly long tube with flower petals up to 1 inch long. 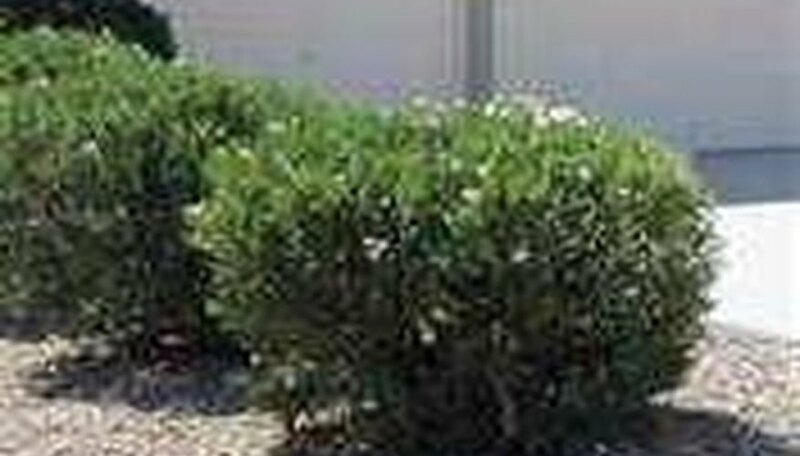 The oleander bush is preferred for its ease of pruning into shapes or use as a privacy hedge when allowed to grow large. The oleander stays green throughout the year; however, this plant can be toxic if ingested, so is not recommended for households with pets or children. Rhododendron and evergreen azaleas bushes are two of the most popular shrubs for light to medium shade locations. Both offer varieties in a wide range of colorful blooms and be grown in USDA zones 7 to 10. 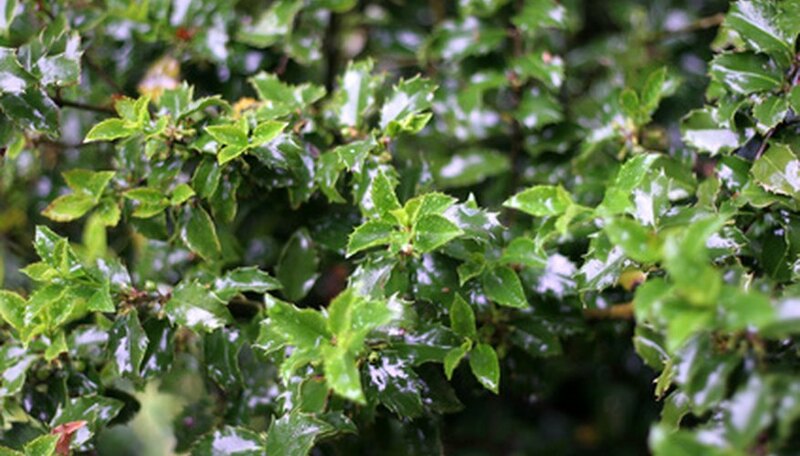 Holly, barberry, boxwood and yew shrubs are excellent shade evergreen selections that not only provide year-round greenery, but produce bright red berries that draw birds to your yard. Mugo pine, several cypresses and firs are other good shade-loving evergreen shrubs. Many of the shade-loving deciduous shrubs will also produce beautiful and fragrant flowers. Popular deciduous shrubs for shaded areas in your yard are blueberry, chokecherry, cotoneaster varieties, honeysuckle, forsythia, hydrangea varieties, privet, spicebush and snowberry. Many shrubs will grow quite large, eight or more feet tall, and just as wide. In most landscapes the areas that are in shade, but in need of a shrub or two, are not expansive spaces and smaller shrubs are more desirable and needed. This is when a dwarf variety of a shade-loving shrub should be considered. A dwarf shrub usually only grows to a height of around four feet, and can be easily pruned to keep it small. Spirea varieties, verburnum varieties and the unusual and attractive species, weigela shrubs are the most popular dwarf shrubs for homeowners. Locate a new spot in your yard for the daphne shrub. It needs shade and well-drained soil. Water the shrub in its present location three days before digging it up, so the soil will be moist when the shrub is removed. Excavate a trench around the Daphne shrub 12 inches wide as well as 12 inches deep, so you can remove the root ball intact. Raise the root ball carefully out of the hole as to not harm it. Wrap the root ball in damp burlap. Carry the shrub by the root ball, not the trunk, to the new location. Place on an old sheet or in a wagon if it is too heavy. Dig a hole in the new location three times the size of the root ball. Position the root ball in the hole at the same depth as in the previous site. Refill the hole halfway with soil. Cut open the burlap and complete refilling the hole. Water deeply until the water puddles on top to re-establish the roots in the new site. Select a strong and straight growing stem to be the main stem on your 1-year-old shrub. Remove all other branches by pruning them as close to the main stem as possible. Clip the tip off of the main stem to stimulate lateral branch growth at the top of the shrub. Hammer a stake into the ground as close to the main stem as possible and tie the stem to the stake. Remove any buds that appear below the top group of buds. Simply pick them off. Sharpen your pruning shears to avoid bruising the shrub. Mix a solution containing 1 part bleach and 9 parts water. Use the solution to sterilize your pruning shears between each cut on the shrubs to avoid the spread of diseases. Plan your entire pruning process before you make your first cut. This will help to ensure that you don’t remove too many branches or the wrong branches. Remove all diseased, broken or dead branches. Remove weak or spindly growth. Remove branches that rub one another or cross the central canopy. Thin the canopy of densely growing shrubs. This will allow the lower limbs to get more light and develop more fully. Prune shrubs in the late winter to early spring before new growth occurs. During this period, it's easier to prune without leaves and buds obstructing the plant-branch arrangement. Use pruning shears to thin out the tallest and oldest stems first. This will encourage hardy branch development. Pruning shears have the capability of cutting up to 3/4 inches in diameter and are ideal for shrubs. Prune back hardy shrubs, such as butterfly bushes, to the first pair of buds. Cut the branch at its point of origin from the main part of the stem. This will create a more open plant without promoting excessive new growth, which can cause the plant to be top heavy. Prune deciduous shrubs by thinning branches of all broken or crossed roots, which can affect the growth of the shrub. Cut back dead branches that have been infected by insects and disease. You can trim many shrubs in November. Light pruning can be done anytime of the year. Severe pruning should be done in winter to early spring so that new growth does not occur before the warm weather arrives. 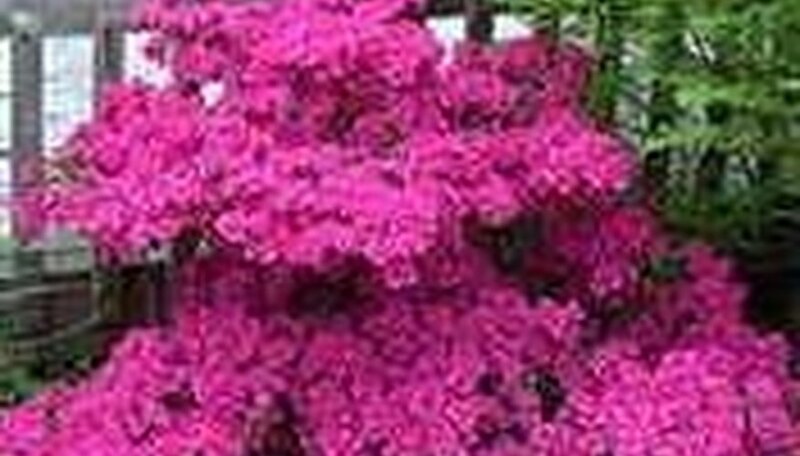 However, some shrubs, like azaleas, should be pruned immediately after they finish flowering. If you cut them back in November, you most likely will remove the next year's flower buds.